Businesses need projects to not only go as smooth as possible but to have the outcome that everyone expects it to. One of the key reasons most projects fail is because the project is not aligned with the organization’s goals. The best way to do so is to ensure that all parties involved goals are being met. 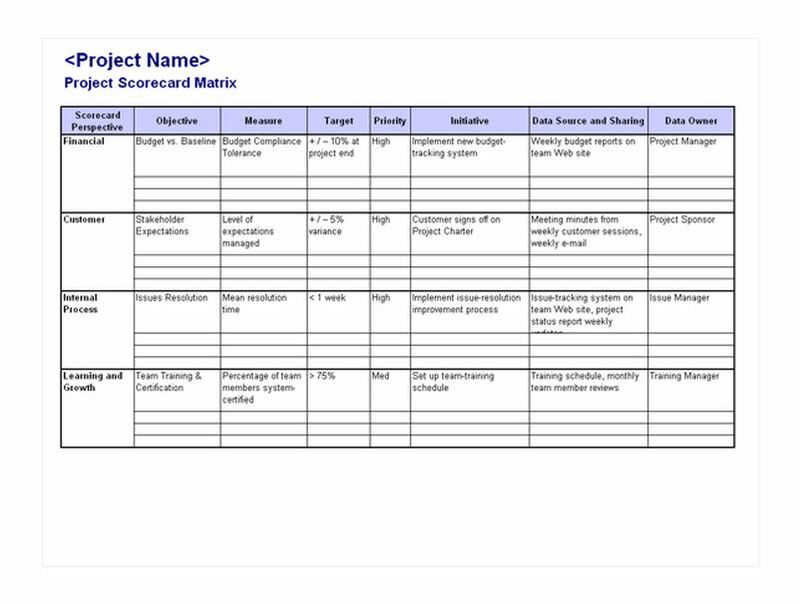 The Project Scorecard Matrix Template improves teamwork and places accountability on everyone. This template is an easy to use guide for any project you may have. Since it is a free template to download, it is yours to use and customize in Excel anyway you see fit. You will create your vision, set objectives, and work through it with other project team members to see the results you are aiming for. The very first tab on the Project Scorecard Matrix Template should be completed first. Fill in the project name, the department, focus area, product or process this is for, who the project manager is, and the project’s role. Next, keep track of any changes that are made by completing the version history section. Afterwards, create your organizations scorecard purpose and definition. Finalize this sheet with whom the spreadsheet is prepared by, their title, and any approval information. The next tab on the project scorecard template is the scorecard matrix. This is where the pertinent information lies. Here you will either utilize the current perspectives, objectives, and initiatives, or create your own. This makes it easy to think through your exact expectations for internal and external customers. Your final tab lists the perspectives and lists the key questions to be addressed. Use this scorecard to your team’s advantage. Take the positive and negative comments to improve your project. Identify trends such as team members who are lagging behind, have a streamlined project meeting to focus on key areas to be addressed, and make continuous improvements on the project as it develops. The Project Scorecard Matrix Template found on this page is an accurate way to measure your project’s success at a quick glance.